This is the 1st part of the paper which was presented by NEIL FULLER at the Acres USA Conference, "Blueprint for Eco-Farming", St. Louis, Missouri in 1997. Physical Soil structure, texture, and porosity will influence aeration, drainage, compaction, erosion and root penetration. This will also affect the efficiency of cultivations, crop rotations and irrigation. Physical limits stop plant roots from getting into the soil. Chemical Acidity, soil nutrient composition and base saturation will influence nutrient availability, deficiencies and antagonistic lock-up. This will affect, and be affected by, the application of fertilisers and lime. Chemical limits stop plant roots from accessing and taking-up nutrients. Biological Microbial activity, crop residue breakdown, humus and earthworms will influence soil formation, root development, the controlled release of soil nutrient reserves and the activity of pathogenic microbes. Biological limits stop plant roots from making good use of the soil. These factors do not operate in isolation. A high calcium soil will be very porous, hold little water and suffer from nutrient lock-up, while a soil that compacts easily will not provide a good environment for beneficial microbes. Although soil formation is primarily a biological function, microbes can only work with the basic chemistry and structure of the soil they Inhabit. British soils, formed since the last Ice Age over 20,000 years ago, clearly show how fertile soil has been built over bare rock, but this soil still reflects the chemistry and physics of its parent material. In order to manage and maintain a fertile soil, we need to understand how these factors work together. The first step is to undertake a comprehensive soil analysis that highlights limitations for the growing crop. This should then direct a long-term fertility programme that harnesses the potential of soil reserves and beneficial microbes. The ideal soil contains 25% air, 25% water, 45% minerals as sand, silt and clay, and 5% organic matter. A soil with this composition would be easy to cultivate, staple, fertile and capable of supporting a diverse range of plant and microbial life. 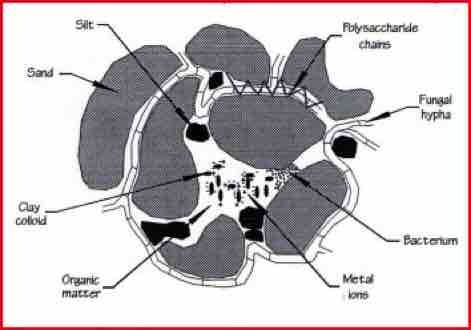 The diagram shows a soil particle, with the mineral element being held together by organic matter and microbes. Soil nutrient reserves are locked in the organic and mineral fractions of the soil. The plant-available nutrition is held by very fine clay colloids and humus. Humus plays a central role in soil fertility, having the ability to improve aeration and drainage, soil stability, ease of cultivation, nutrient availability and microbial activity. Humus is made by microbes as they decompose organic matter, and has many soil-improving properties. Humus increases the nutrient holding capacity of the soil, acts as a natural chelating agent for micro-nutrients and reduces the toxic effects of pollutants. Soils with good levels of humus warm up quicker, encouraging the activity of roots and beneficial micro-organisms. Nutrients become available to plants as minerals in the soil solution, or once released from soil reserves by root acids and microbial enzymes. 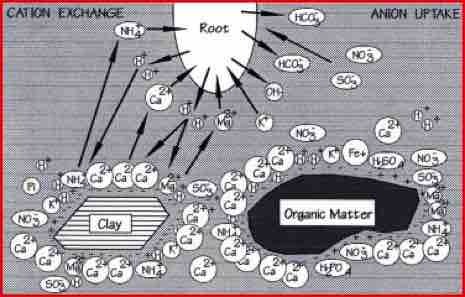 Soluble nutrients, such as nitrates, can move to the root zone as plants take in water. However, most of the available nutrition is held on the surfaces of fine clay and humus particles. These surfaces, called exchange sites, have a negative charge that attract and bind positively charged minerals, called cations. Cations are formed when compounds dissolve and return to their basic components. 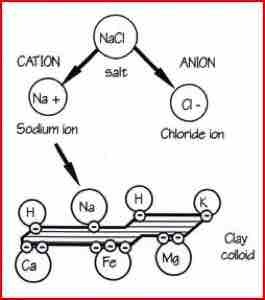 The example shows common salt becoming a positive sodium cation and a negative chloride anion. The main cations are calcium, magnesium, potassium, sodium, ammonium and the metallic elements. The main anions are nitrate, sulphate, phosphate and borate. The amount of cations held by a soil is measured as the Cation Exchange Capacity (CEC), which is measured as milli-equivalents (me) per 100 gms of soil. A value of 1 me would mean that the soil can hold 450 kg/ha of calcium, or 270 kg/ha of magnesium, or 880 kg/ha of potassium, or 22 kg/ha of hydrogen. In order to maintain the equilibrium, the negative charges in the soil must be balanced by positive charges. This means that exchange sites are always full, safely storing plant nutrients. In order to release a cation held on an exchange site, some other material must first dislodge or replace it. This is known as Cation Exchange. Plants roots produce organic acids, or exudates, which act as a lubricant for the root, a food source for microbes and provide hydrogen ions. This hydrogen is used to drive the cation exchange process, Both plants and microbes employ the technique of cation exchange to release nutrients from the soil. It has been estimated that up to 95% of a plants mineral nutrition goes through the exchange process. The relative amount of each nutrient on the exchange sites is measured to determine base saturation. This term is used to indicate nutrient balance and the effects of each element on the exchange process. When any one element dominates the exchange sites, nutrient imbalances, antagonistic lock-up and genuine deficiencies can occur. The ratio of one element to another is far more important than levels of available or total nutrients. For example, a calcium-dominated soil will have problems with phosphate and trace element availability, which will be reflected by the plants and animals feeding from that soil. Cation exchange and base saturation also determine the pH of the soil, and should always be measured before any form of fertiliser or lime is applied. Cation exchange provides a convenient means of storing nutrients as they are released from soil reserves, before they are needed by the plant. Without this facility, available nutrients would be washed away. The exchange process also gives plants a means of controlling nutrient uptake, via root exudates and beneficial microbes, creating a supply-and-demand situation. The importance of cation exchange is being illustrated by GSP yield mapping, which is showing large variations in crop growth that are neither explained by standard soil tests, nor corrected by additional NPK fertilisers. Almost 95% of all plant material is made up of carton, hydrogen and oxygen. The remaining 5% or so constitutes mineral elements, which we call nutrients. While nitrogen, phosphate and potash are considered major nutrients no less important are the trace or micro-nutrients. 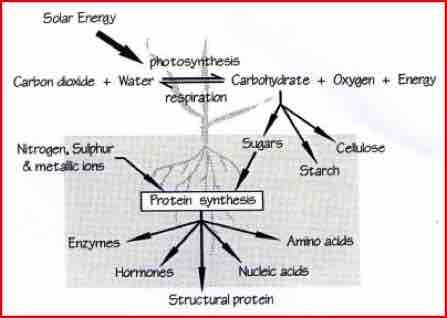 These elements are used to convert the basic sugars that are produced by photosynthesis, into the amino-acid building blocks of life. These vital acids are shaped into proteins, enzymes, hormones and DNA. Photosynthesis is the process that plants use to pull carbon from the air and turn it into carbohydrate. Driven by sunlight, this process is the basis for all life on Earth. Trace elements are needed to maintain the activity of this essential process. In the form of enzymes, they act as the plants bio-chemical tool kit and allow metabolism to function properly. Enzymes are not consumed by the processes they regulate, and as such, only small amounts of each element are required. However, any limit to availability can place a large stress on the plant, reducing health and growth. Carbon (C) Major constituent of all organic molecules, accounting for around 40% of plant dry matter. Hydrogen (H) Used as an energy carrier and links with Carbon to form sugars & carbohydrates (CHO). Oxygen (O) A vital part of most organic compounds, carbohydrates and redox reactions. Nitrogen (N) The key to protein formation, amino-acids & enzyme systems. Phosphorus (F) Essential to all living cells for sugar formation and the storage & transfer of energy. Potassium (K) Regulates water movement, plant structure and the transfer of carbohydrates. Sulphur (S) Links with Nitrogen to form protein and is a major part of amino-acids and enzymes. Calcium (Ca) An essential part of cell walls and membranes, protein synthesis and plant defence. Magnesium (Mg) Essential to photosynthesis, chlorophyll, cell repair and metabolism. Boron (P) Links to Calcium and Nitrogen uptake, protein synthesis and the formation of hormones, sugars and CHO. Copper (Cu) Involved in protein synthesis, seed formation, plant defence (lignin & phenols) & chloroplast. Iron (Fe) Essential to enzymes involved in respiration, photo-synthesis and disease resistance mechanisms. Manganese (Mn) Vital to photosynthesis, enzymes, cell repair and disease resistance mechanisms. Molybdenun (Mo) Vital to enzymes needed to regulate and control Nitrogen metabolism. (N-fixing bacteria). Zinc (Zn) Required for starch formation, enzyme systems, phenols and disease resistance mechanisms. Silica (Si) Considered non-essential, but is involved in cell membrane formation and disease resistance. Simply having these minerals in the soil is not enough to ensure healthy, productive plant youth. The elements must be available, and in the correct ratios and forms. Two basic rules govern the availability and metabolism of nutrients. This states that "the yield of a crop is limited by the deficiency or insufficient supply, of any one element, even though all other necessary elements are present in adequate amounts". This means that if a plant needs 20 kg of nitrogen and 20 gms of boron, if the boron is limited to 10 gms, growth will be reduced and nitrogen will not be used effectively. This states that "mineral availability and plant uptake will be limited by the element most dominant in the soil, either in solution as an applied fertiliser, or in the cation exchange sites of the soil complex". This means that nutrient lock-up and antagonisms will cause minerals to remain unavailable to the plant, as happens when calcium ties up phosphates and trace elements. Conventional agriculture thinks of nutrition in chemical terms - NFK. Put plant nutrition relies on the biological activity of microbes - something which has been seriously overlooked. Microbes play a central role in the decomposition and recycling of energy and nutrients held within organic matter. Microbes convert complex biological materials into simple units, which are then used to fuel the metabolism of plants and animals. 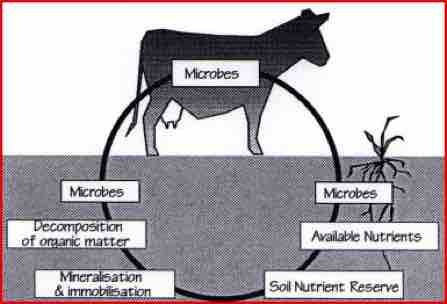 Soil microbes are responsible for the controlled release of inorganic minerals. By producing acids and enzymes, bacteria can dissolve rock phosphate and make potassium, magnesium, calcium and trace elements available to plants. Nutrients such as nitrogen, carbon and sulphur can be pulled from the air and fixed into a biological form. Animals also rely on microbes. The digestive system is host to many different types of microbes that are used to break-down plant material such as cellulose and proteins. The microbes feed on these materials and convert them into forms which the animal can digest, metabolise and make use of. As a plant has no digestive system, it must rely on the micro-biology of the soil to maintain a supply of nutrients. The relationship between plants and microbes has evolved over millions of years, to good effect. But in agriculture, this relationship is upset by NFK. fertilisers and toxic rescue chemicals. Biological farming systems harness microbes, and find that nutrient availability increases over time, despite the fact that little NPK fertiliser is being applied. The rhizosphere, or root zone, is where the physical, chemical and biological properties of the soil combine to feed the plant. The ease with which a root can penetrate the soil and obtain nutrients will determine how well the plant grows. Root hairs extend the surface area of the root system and begin to extract nutrients from the surrounding soil. If the soil structure is poor and compaction is a problem, root hairs will not be produced and nutrient uptake will be reduced. As roots develop and extend into the soil, they release energy-rich organic acids, which make it easier for roots to move through the soil and break down soil particles. These exudates attract bacteria, fungi and actinornycetes, which feed and multiply. As microbes do this, they release and convert soil nutrients, which the plant can then consume. Plants can spend anything from 10% to 90% of their energy income on supporting soil microbes. In return for this, microbes decompose organic matter, fix nitrogen from the air, and promote the availability of water, carbon and plant nutrients. Microbes also improve soil structure by producing materials called polysaccharides. These long chain-like glues bind soil particles together, maintain porosity and give the soil more resistance to compaction. By building nutritional defences within the root and actively competing with pathogens for food and space, beneficial microbes can make a major contribution to plant health. Anti-pathogen materials such as the anti-biotic streptomycin, and direct attacks on pathogenic cells by other microbes, can generate a high level of biological control for soil-acting plant diseases such as Rhizoctonia, Take-all and Sclerotinia.